Solid fuel space heaters, commonly know just as solid fuel stoves, are the traditional and most commonly used form of canal boat heating. Often installed as a primary heat source they are also a great secondary form of heating, useful for an occasional fire during chilly summer evenings. Narrowboat Solid Fuel Stoves… Which Fuel? Some stoves are classified as multi-fuel in that they are constructed in a way that enables them to burn wood as well as household coal/smokeless fuel. To avoid damage to the appliance it’s worth checking with the manufacturer to confirm the correct fuel type for your set up. Smokeless fuel is commonly used as a fuel and heating source for a stove, and is essential in any ‘Smoke Free Zones’. Smokeless fuel can be a variety of solid material which can be used as fuel for a stove but doesn’t create smoke. Smokeless zones are declared by local councils and are most likely in to be present in towns and cities around the country, it means it is illegal to burn fires that produce smoke, with the exception of garden fires and BBQ’s. Smoke free zones were introduced as a result of the London smog of 1952. Anthracite – sometimes known as hard coal, it is a naturally occurring fuel that is burnt for heat. It is black and shiny in appearance. Anthracite has the highest carbon content of all coals and lowest moisture content. It produces no smoke and is an efficient, economical and environmentally friendly form of heating. Coke – the smoke producing constituents of this type of coal are removed by the coking process. Charcoal – this burns hotter and cleaner than wood. Often used for cooking and gives of no smoke when burned. Wood should be seasoned for at least 6 months before burning to prevent the build up of combustible tar and creosote in the flue pipe. Look to burn smokeless fuel specifically designed for enclosed solid fuel appliances. Bituminous or household coal burns with a long flame which can damage the top deflector plate or in extreme cases ignite residue in the flue pipe. Other types not approved for enclosed stoves can burn too hot damaging the grill or riddle plate. Cast iron designs will outlast steel plate so you generally get what you pay for. Fuel needs fresh air to burn efficiently so ensure there is adequate fixed open ventilation on your boat. British Standards recommend a fixed open ventilation of 550mm² per kW of output. Refer to the Boat Safety Scheme, your local BSS examiner and BS 855:2011 for the current guide to solid fuel stove installation best practice. Introduced in the wake of several fatalities directly related to the incorrect installation of solid fuel stove space heaters, it would be daft to ignore the British Standard. The code is not compulsory (at the time of writing) but will always be referred to in the event of an accident and any subsequent investigation. It is likely insurance assessments will be carried out with the code in mind. A good stove and its chimney should be recommended by the manufacturer for use in narrowboats. The system should be installed by a competent person strictly to the manufacturers instructions. The solid fuel stove should be the right size for the space to be heated and have securely latching doors which can’t jolt open. Stove, flue and hearth/surround should all be fixed firmly in place. It is recommended to use seasoned/very dry wood or smokeless fuels and avoid bituminous coal. The flue & chimney should be cleaned very regularly and inspected more often. Door seals, windows and liners should be kept sound. Insulated flue pipes should be chosen to make the smoke rise & keep anything flammable well away. When burning efficiently, solid fuel stove space heaters and un-insulated stove pipes can easily become hot enough to ignite surfaces, paint and other combustibles a fair distance away. Heat can pass through a single fireproof panel on the on the wall so it is recommended to build in a 10mm air gap capped with 25mm thick calcium silicate board, tiling over the top and then at least 45mm gap to the main stove body. This should extend a minimum of 200mm above the stove. In all cases refer to the stove manufacturers recommendations. Powder mix tile grouts and cements have a higher heat resistance than ready mix varieties. Install carbon monoxide (CO) and optical smoke detectors. 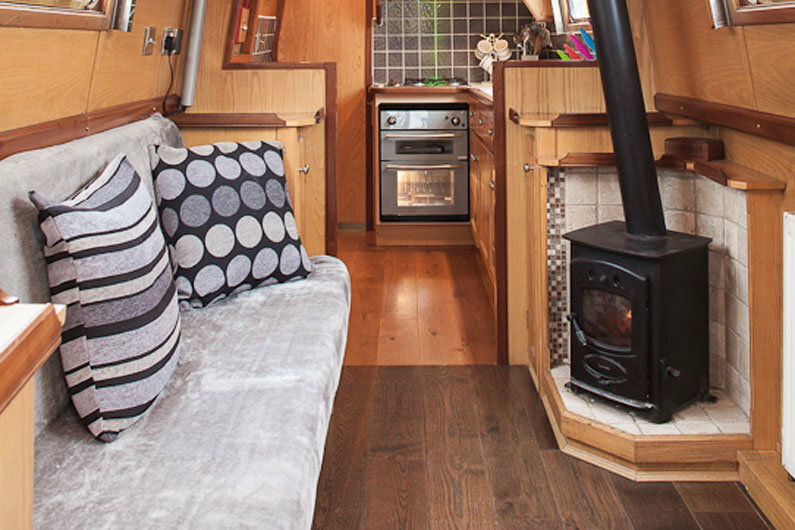 If you are purchasing a sailaway narrowboat or widebeam you may want to ask your boat builder to install your solid fuel stove as it isn’t for the faint hearted to be cutting a flue space in to your new sailaway shell. 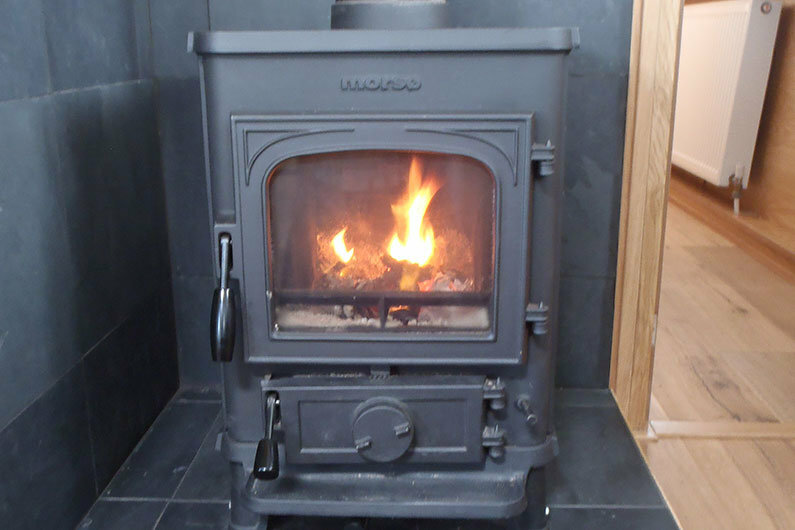 Narroboat Solid Fuel Stoves… Keeping It Clean & Safe! BS 8511:2010 recommends very regular sweeping of the chimney and flue. In practice every two weeks may seem excessive but regular maintenance prevents expensive replacement costs. Chimney deposits can be highly corrosive and if not removed will eat the steel of the chimney and flue pipes. Fire cement joints should be regularly inspected and re-sealed if no longer gas tight. Fire bricks can sometimes be repaired with fire cement if cracked but replace them if they are broken and crumbling. Replace missing or loose rope around door & glass where fitted and replace cracked or broken glass. Keep the exterior clean and sweep regularly underneath to remove any potentially combustible materials that may have accidentally fallen behind or under the stove. Remember to regularly check the correct operation and clean your smoke and CO detectors. Siting of the solid fuel space heater on a narrowboat should be carefully considered. It ideally should be away from steps, escape routes and where it won’t cause obstruction. They do get very hot so consider their safe use and installation with regards to children & pets. Fuel has to be sourced, transported and stored. 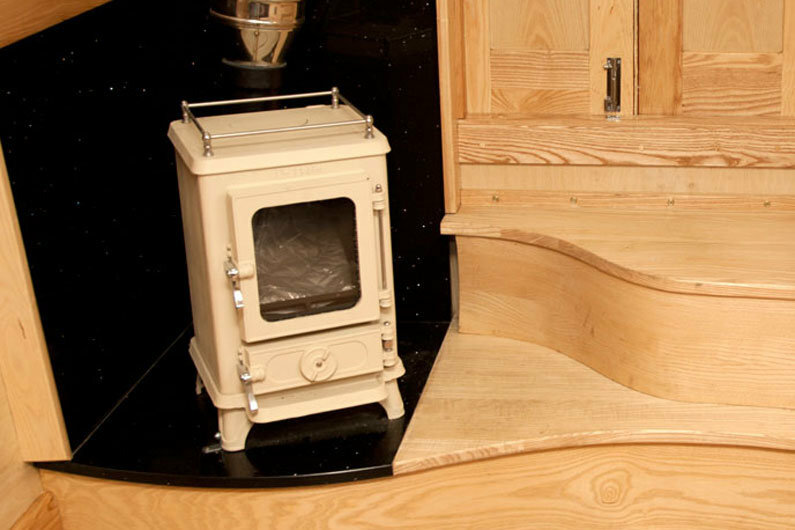 Allow space inside the narrow boat for your wood box, coal scuttle and companion set. With some models of stove and the right fuel combination it is possible to keep the fire in overnight. If your stove is kept banked up over 24 hours during winter you may use up to 3 bags of smokeless fuel per week. If you burn wood, this should be seasoned if possible. Seasoning involves drying the wood before burning otherwise a lot of the heat in the fire-box is used to heat up and evaporated the moisture in the wood. Seasoning can take from 6 months to 3 years depending upon the wood. Logs will lose 10-25% of moisture per year depending on the type of tree. Unseasoned logs causes condensation to form in the stove pipe, the build up of chimney deposits which produces a tar like substance. Burning damp wood on your narrow boat reduces the efficiency as it lowers the temperature of the fire and will often leave un-burnt wood which produces more carbon monoxide. You would need to burn around three times as many unseasoned logs to achieve the same heat output as well seasoned logs. Burning damp wood also increases the risk of a chimney fire as the chimney can easily become blocked. How do you know if the wood is ‘dry’? Simple tap it and you will hear a hollow sound; the bark will fall away; and the log will often have cracks in the ends. A moisture gauge can also be used to test the moisture level. Testing the thickest log first, by splitting open the log and testing against the grain will give a good indication as to whether the logs are ready for burning or not. You should be looking for a moisture level of less than 25%. With regards to unwanted chimney fires and to ensure clean and efficient combustion, the stove needs regular cleaning out. Ash cans probably twice a day and the pipes need sweeping very regularly. You will soon realise that solid fuel stoves produce dust. This is an unfortunate trade-off for the convenience and beauty of the appliance but is worth bearing in mind if you or yours have any allergies or respiratory issues. As the heat source is localised, silent running stove top fans can be used to great effect to circulate warm air throughout the boat. These can be particularly effective if the stove is located at one end of the narrowboat. They do need careful siting on the stove top to ensure trouble free operation and do check that the model you buy is suitable for the high temperatures commonly found on the top plates of multi-fuel stoves. Some of these fans are only suitable for gas fired stoves which run at lower temperatures. Cooking can be done on the top surface of many models and the web is a good source for stove top and ash can recipes for the more adventurous. Measurable savings can be made in your water heating bills by investing in a good quality enamelled cast iron kettle which is used to heat water for washing-up, hot drinks and washing. Some solid fuel stove space heaters can be fitted with back boilers. If the fire is on, why not use the heat to heat water for heating radiators or a calorifier. Remember though, the stove needs to be fired up and running hot to heat the water so this may not be an all year round solution. If you like the idea of a stove that can heat water in a boiler then careful consideration needs to be given to the installation. Generally 28mm copper pipe is run to a radiator or two to provide heating in bedroom or bathroom areas. Two methods are used to circulate the water, one being convection and the other being via a conventional pump. If the top feed pipe from the stove boiler is angled upwards to the radiators the hot water will rise through the pipe, fall as it cools in the radiator and return to the boiler to occupy the volume left by the less dense warming, rising water. Simplicity itself so long as you allow for the pipe rise along the length and for a small expansion tank to feed the system. If this is not possible a 12v pump running off the narrow boat domestic batteries or a 240v AC pump running off the inverter can be installed to circulate the water. A supply of domestic hot water can be achieved by plumbing the hot water feed pipes into a calorifier. This is essentially a copper or steel coil inside a water tank similar to the domestic immersion heater. The use of these is covered in the Plumbing chapter. Finally, coal savers are offered as optional extras by some manufacturers. These are devices, usually of cast iron or fire brick, which sit in the fire-box either side of the grate and reduce the amount of combustible material you can feed in to the stove. They enable small amounts of solid fuel to be burnt at high temperatures thus aiding the controllability and efficiency of the stove. An efficient stove is a safe and clean stove. In all cases, the feel-good factor of setting a fire & enjoying the glow is priceless.